Essential Fatty Acids: What's the Deal? It's summer in the Canadian Rockies and the alpine wildflowers are in peak bloom. It's times like these I feel blessed to enjoy where I live and am thankful for the clean air, open spaces and wild country that I call home! This was a cloudy day last week and a beautiful run through the wild arnica (good for tissue healing) around Buller Pass. This was 30mins from my house. That makes me happy! All these beautiful flowers, plus a post by Paleo For Women's Stefani Ruper inspired me to want to write own post about Evening Primrose Oil. I got going on that and then whamo! Up popped a post by Mark Sission that inspired me to write a more general post about Fatty Acid Supplementation. This wee story may be the starting point for a longer novella about fatty acids in pregnancy but for now, here's my two cents on essential fatty acids. Before we jump right into why I encourage DHA supplementation during pregnancy, let's look at why, in the Paleo community, we talk about balancing our omega-3 and 6 ratios. Why should I care about Omega3's vs Omega 6's? Good question! Why the heck should you care? I'm not a big fan of 'micromanaging' what you eat, but, I think it can be beneficial to take a big picture approach and look at your diet every once in a while. This is especially important if you are suffering from a chronic condition, are trying to optimize fertility or are expecting a little cavebaby! To explain it briefly and simply, omega-6 fatty acids (mostly Arachidonic acid ) promote systemic inflammation in the body by stimulating inflammatory prostaglandin's. Omega-3 fatty acids (mostly EPA/DHA) aren't in themselves anti-inflammatory but rather stimulate a concurrent cascade of chemical activities that basically slows the entire inflammatory cycle down by competing with binding sites and decreasing tissue concentration of inflammatory prostaglandin's. Therefore, the amount of omega-3's you need in your diet should correspond to the amount of omega-6's in your diet. Too much omega-6 and you run the risk of developing diseases that are related to inflammation. These include cardiovascular disease, Chrohn's disease, hormone dis-regulation and insulin resistance. Being in a constant state of inflammation can also make conceiving more difficult. 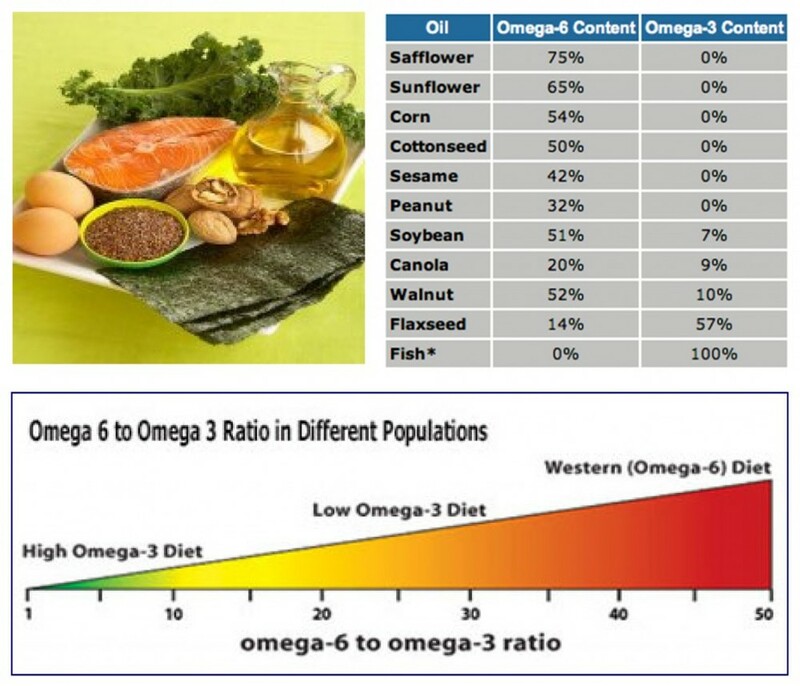 This is why we are all so fascinated and obsessed with omega 3:6 ratios. Prostaglandins are autocrine or paracrine regulators rather than hormones. They are produced an act locally within cells and tissues. Prostaglandins have a wide variety of important functions in our body including: being responsible for the cascade of hormones to start labour, smooth muscle regulation, cell growth, hormone regulation, platelet aggregation (formation of blood clots) and localized inflammatory responses. What is the optimal Omega 3:6 Ratio? Well, good question. I don't think anyone really knows. A standard american diet (SAD) typically includes ratios of 1:10 or upwards of 1:25. That's totally nuts! Many paleo authors have suggested a ratio of 1:1 -1:3 is a more reasonable ratio for optimal health. These ratios more closely resemble the ratio's that our traditional ancestral diet may have contained. Well, good question. If you eat a squeaky clean paleo, ancestral or primal diet, with no processed food, no inflammatory seed oils (think canola based margarine) it's easy to think you're doing a smashing job! That being said, even I occasionally cave and eat a bag of organic chips made with canola, and there are tons of Omega-6 fatty acids found in many paleo/primal friendly foods too. These include delicious delights such as avocados, nuts, nut flours (aka paleo treats), poultry and pork products (yup...bacon). Most of us aren't perfect in balancing these ratios and we tend to be exposed to many more omega-6 fatty acids in our diets than may be optimal. It's good to look at your intake of these foods and be honest about how much poultry, nuts and avocados you really consume. To aid in ratio optimization, try to add in more grass-fed beef, game or organ meats, watch your consumption of nuts and seeds (walnuts and macadamias are a good choice), and try to include more cold water fish like herring, mackerel and sardines. You can also get DHA from flax, hemp and chia but it must be converted in the body from ALA to EPA/DHA. Unfortunately, this process isn't very efficient. According to Chris Kresser, less than 5% of ALA getting converted to EPA with less than 0.5% being converted to DHA. Best to stick with the fish and grassfed meats. If you are trying to treat a specific health condition, trying to conceive or are pregnant or breastfeeding, supplementation may be a good choice and is supported by both mainstream medical doctors and most natural health practitioners alike. There are numerous studies touting the benefits of supplementation with DHA, most notably from fish oil. Supplementation of DHA from fish oil has been shown to be beneficial for fertility, pregnancy and breastfeeding. Supplementation during breastfeeding dramatically increases DHA content of breastmilk...essentially making it "super-milk"
DHA is one of the few fatty acids that crosses the placenta. Fatty acids are required by the developing fetus as a source of energy, to maintain the fluidity, permeability and conformation of membranes and as precursors of critical bioactive compounds such as prostacyclins, prostaglandins, thromboxanes and leukotrienes. DHA synthesis is limited in the fetus and supplementation or high dietary intake of DHA has been shown to increase overall fetal DHA levels and effect m-RNA expression. Translation: these are all good things! DHA absorption by the fetus is shown by studies to really get ramped up in the final 10 weeks of pregnancy. So, if you are nauseated or just can't tolerate fish oil caps in the first half of pregnancy, no biggie. You can make up for it later when you are feeling better. What supplements should I buy? This is a wee little Krill...he's a good choice if you're going to supplement with DHA. Good question! I coach clients to look for DHA from krill or other small marine animals. Krill oil has been show to be more easily absorbed and increase blood DHA levels faster and more efficiently than traditional fish oil capsules. Plus, krill are small little animals and the lower you eat on the food chain, the less risk you have for being exposed to contaminants and toxins. Make sure your supplement has at least 200-300mg of DHA per cap and take between 1g-2g daily. Chris Kresser wrote a long post all about how to choose a fish oil that is worth a read. For the Fish/seafood allergic there are options! Don't do fish? If you're like me and are allergic to fish/seafood/shellfish there is one other option for getting your DHA. Marine algae. Studies have shown that taking a supplement of marine algae based DHA can be just as effective as fish oil. It's more expensive but if you have no other options, it can be a good solution. What is Evening Primrose Oil (EPO)? "HOLD THE PHONE, aren't additional omega-6 fatty acids a bad?" Well, , yes, I'd agree, but, EPO is an exception. EPO is unique in that it is mostly comprised of (75%) Gamma-Linoeic Acid or GLA. GLA is one of the few "anti-inflammatory" omega-6's fatty acids. It does this by it mitigating the inflammatory prostaglandin response caused by Arachidonic Acid (aka canola, safflower, sunflower oil) via similar pathways as DHA and EPA. Inflammatory prostaglandin excess can be responsible for a myriad of PMS symptoms including cramps, breast tenderness, joint pain and bloating. Taking a supplement of EPO may help to reduce these effects and make PMS a bit more manageable. Many PMS sufferers are found to have unusually low levels of GLA in their systems, which is why supplements might help so much. EPO can also help promote the absorption of iodine, a mineral that can be present in abnormally low levels in women with PMS and hypothyroid conditions. What woman doesn't want help with the delicate balance of mood regulation during their menstrual cycle or pregnancy? Studies have shown that supplementing with EPO can help reduce some of the mood changes associated with PMS, pregnancy and in the postpartum period. Many studies focused on the use of DHA, not GLA for pregnancy mood related changes so for clients who have struggled with mood in the past, I usually recommend a high dose fish oil or placental encapsulation (that's another post!) for this particular complaint. There are some claims that claim that taking evening primrose oil can help a woman conceive by making her cervical mucus more stretchable and slippery, enabling the sperm to move more quickly through the uterus and into the fallopian tube. Can't hurt! Many midwives recommend supplementation of EPO during the third trimester of pregnancy to help soften and ripen the cervix in preparation for labour. I used to recommend this too until I did some further research. Honestly, it doesn't really seem to work. There have been many midwifery led studies in North America and Europe that show no change in cervical ripeness with EPO supplementation. Bummer. Does it hurt? Nope. Will it help? Probably not, but again, it doesn't hurt!